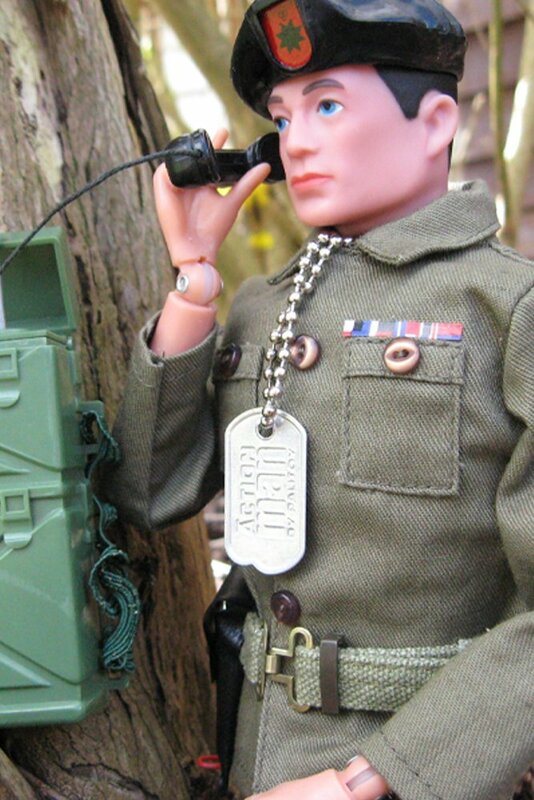 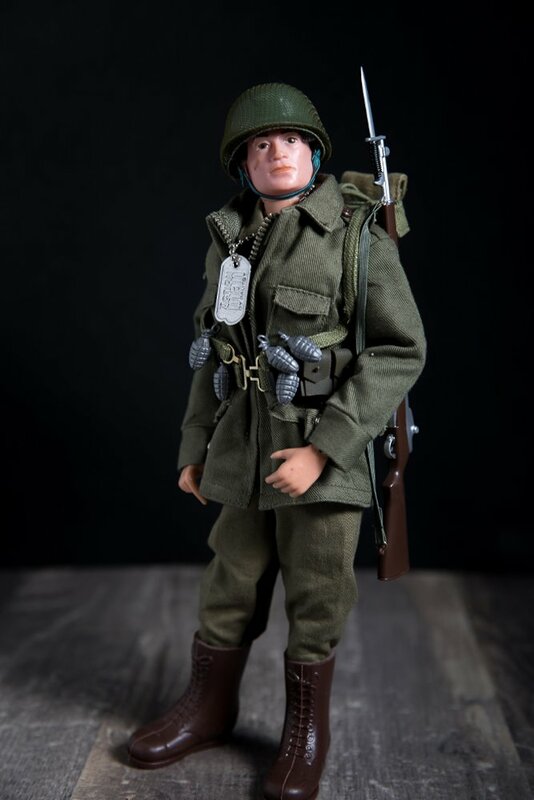 1966, Combat Soldier, You could kit your combat soldier out over several accessory cards, the one pictured is equipped with the Combat Field Jacket, M1 Rifle, M1 Bayonet, Cartridge Belt, Hand Grenades, Field Pack, Entrenching Tool. 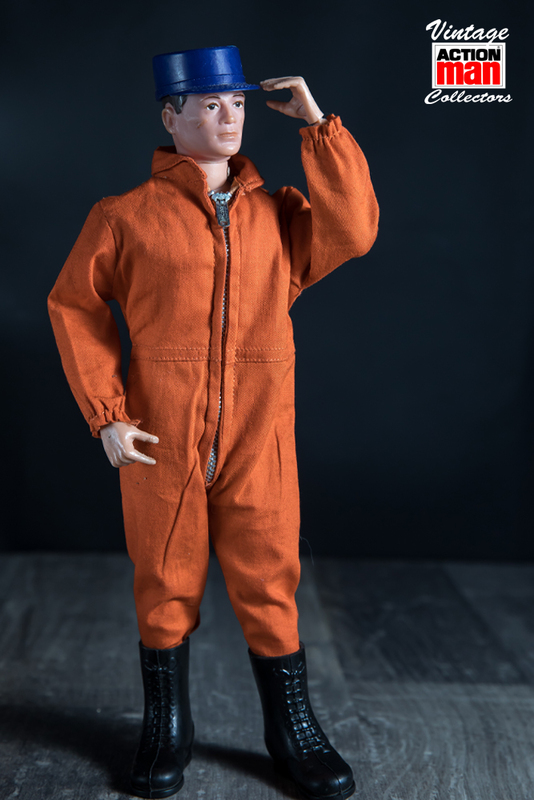 Helmet with netting. 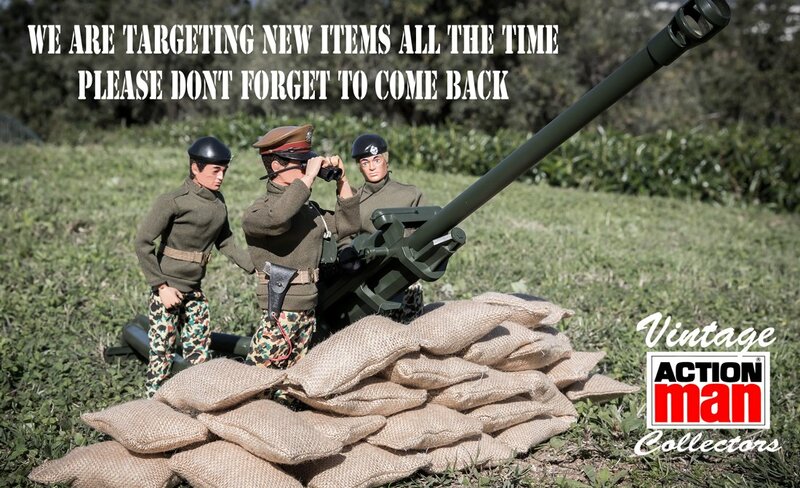 finding these items in mint unbroken condition can be a problem. 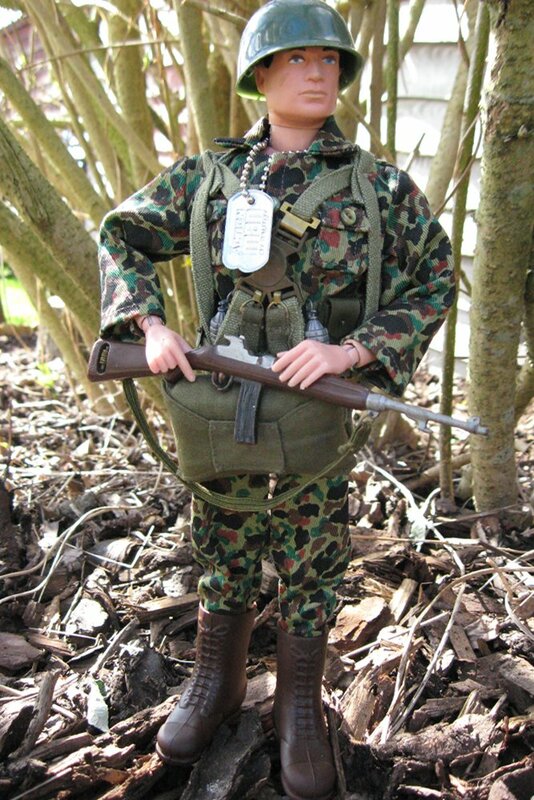 1966, Action Man Navy Dress Parade, Built on the Basic Sailor boxed figure, White Truncheon, White Cartridge Belt, M1 Bayonet (same as the soldiers) White M1 Rifle. 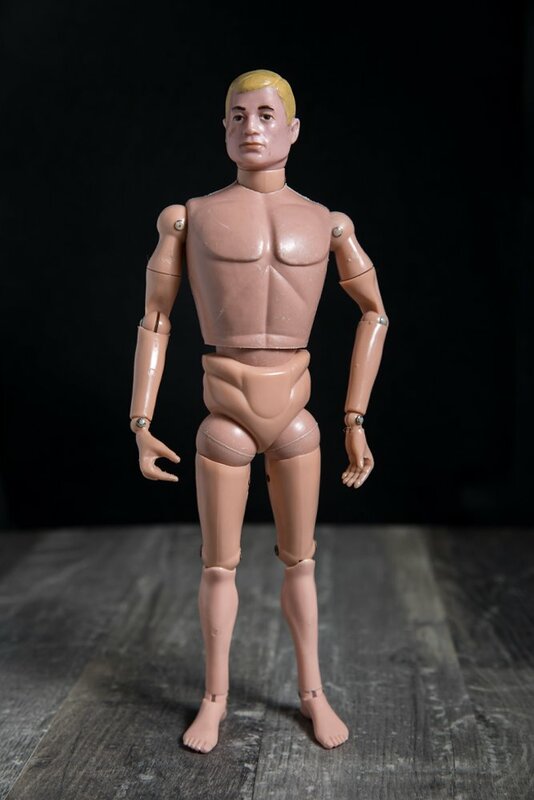 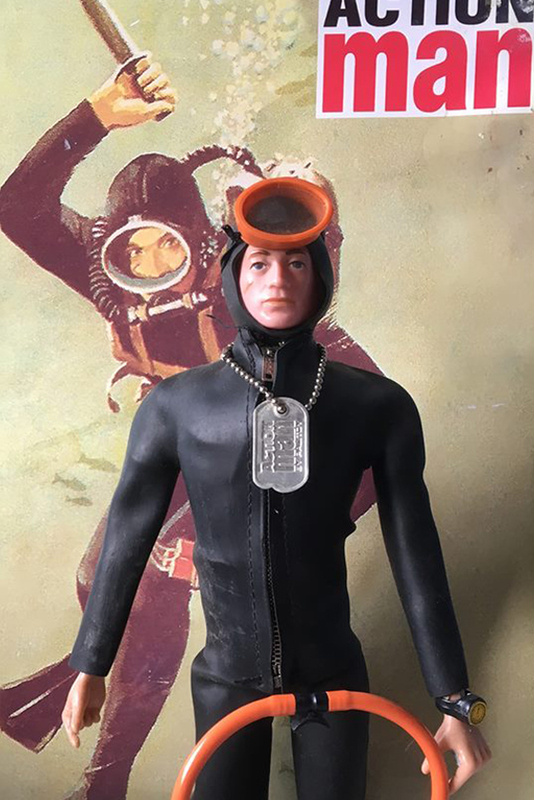 1966, Action Man Frogman, The Navy Frogman outfit is extremely difficult to find due the rubber perishing over time, Outfit Includes: Rubber 2 Piece Wetsuit, Swim Fins (Flippers) Twin Air Tanks, Mask, 3x Dynamite, Knife and Depth Gauge. 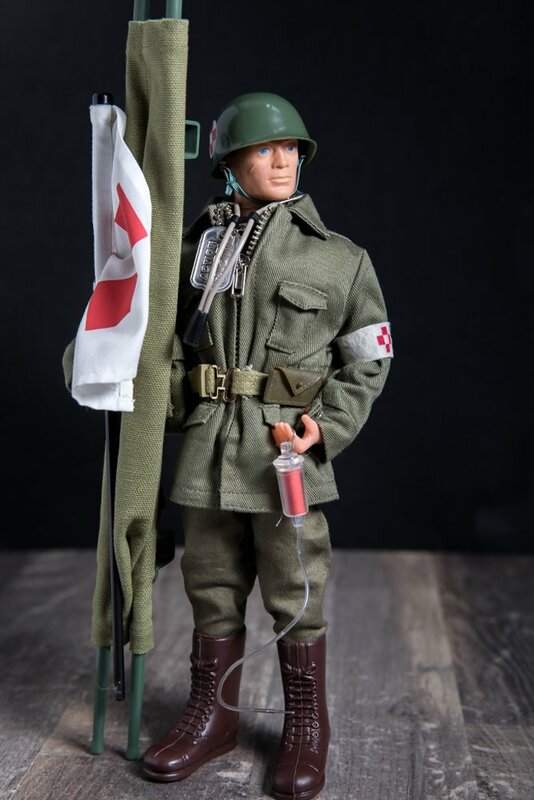 Many thanks to VAMC Member Paul Armstrong for the use of the photo. 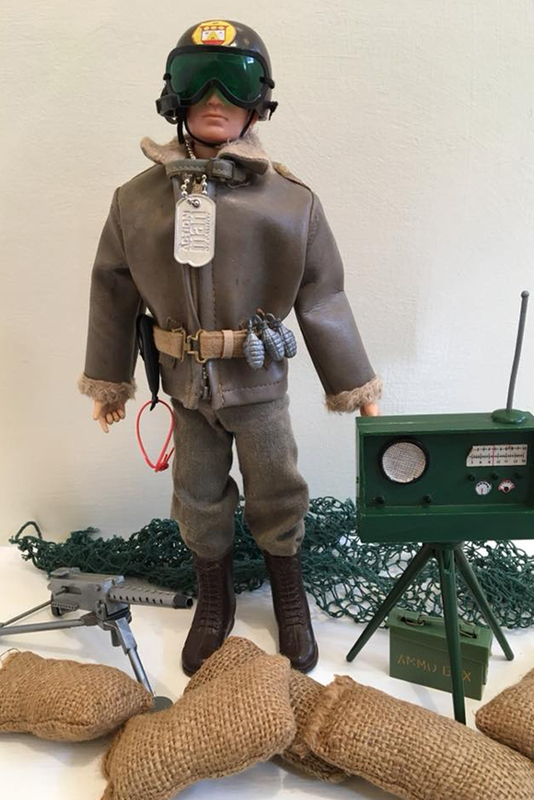 1966, Scramble Pilot, A beautiful set once complete and very highly detailed for a toy of the 1960’s. 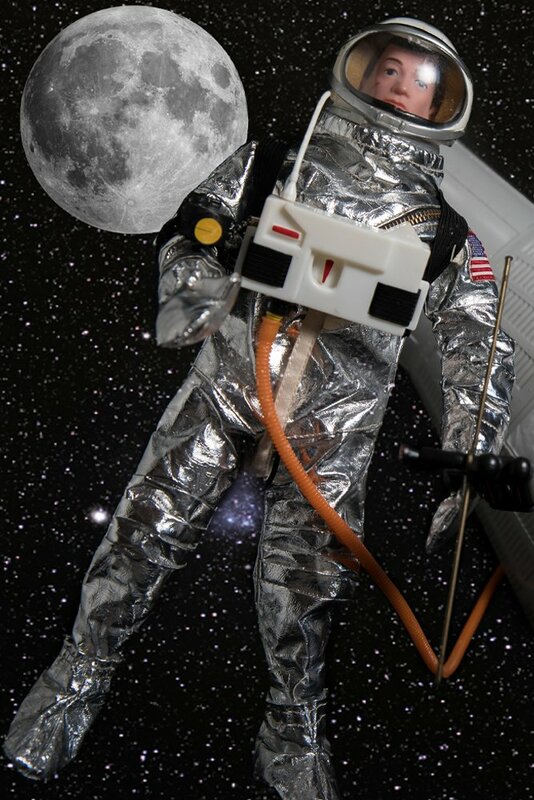 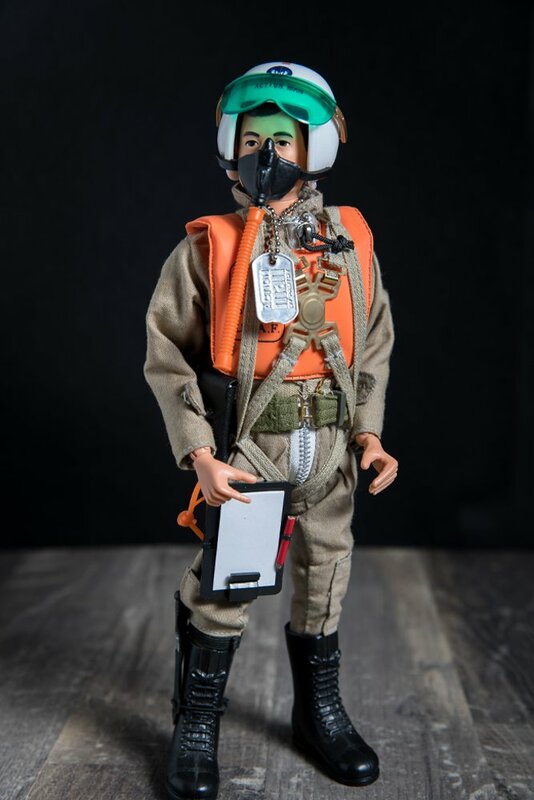 Set includes: Flight Suit, Life Vest, Parachute Pack, Pistol Belt, Clipboard with Pencil, Flare Gun, Knife, First Aid Kit, Life raft, oar and anchor as an optional extra. 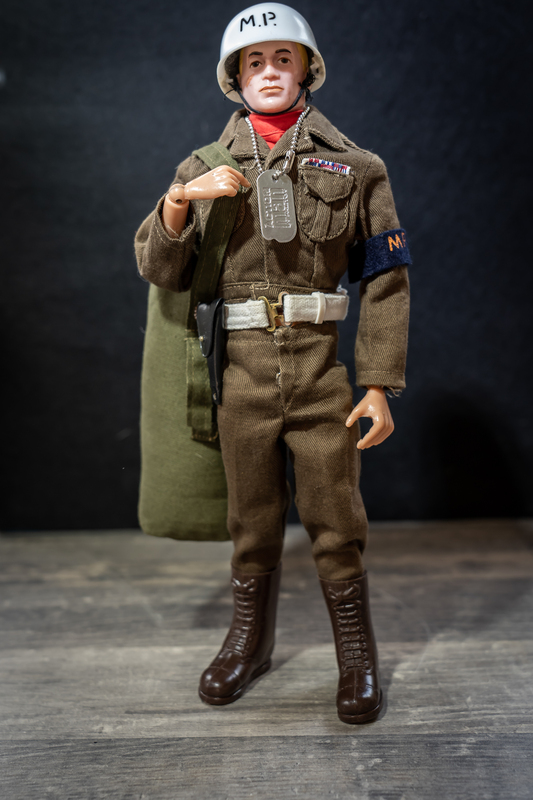 1966, Military Police, Outfit includes: Tunic, Trousers, Tall Brown Boots, White Pistol Belt, Tan Truncheon, Red Bib, MP Arm Band, White MP Helmet, Kitbag. 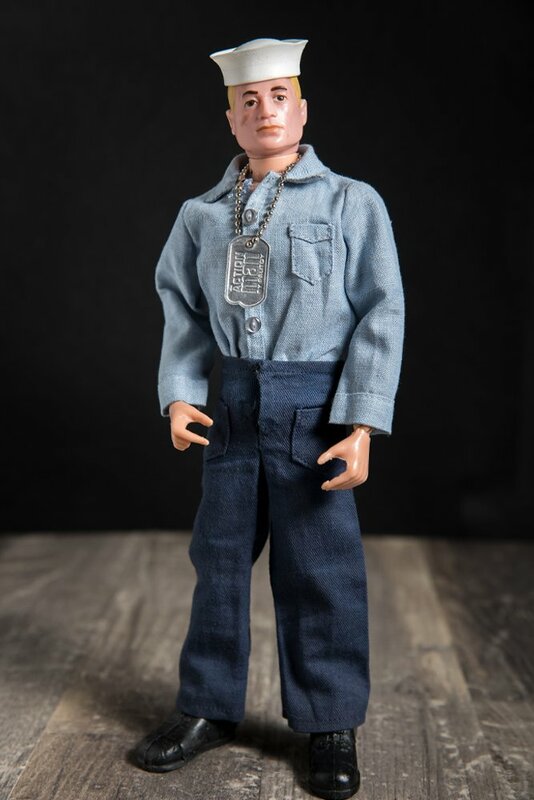 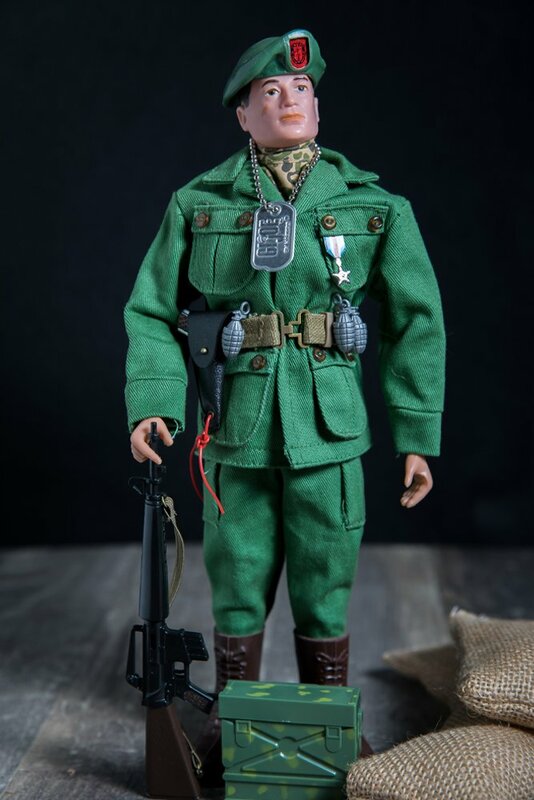 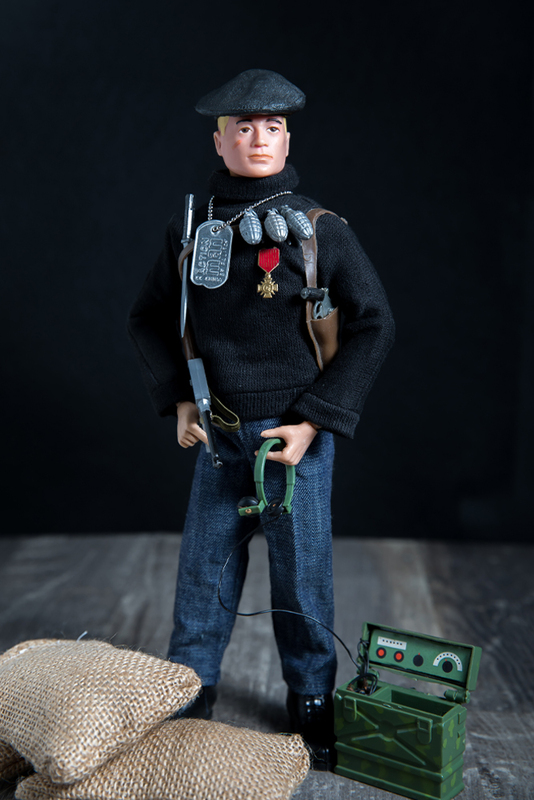 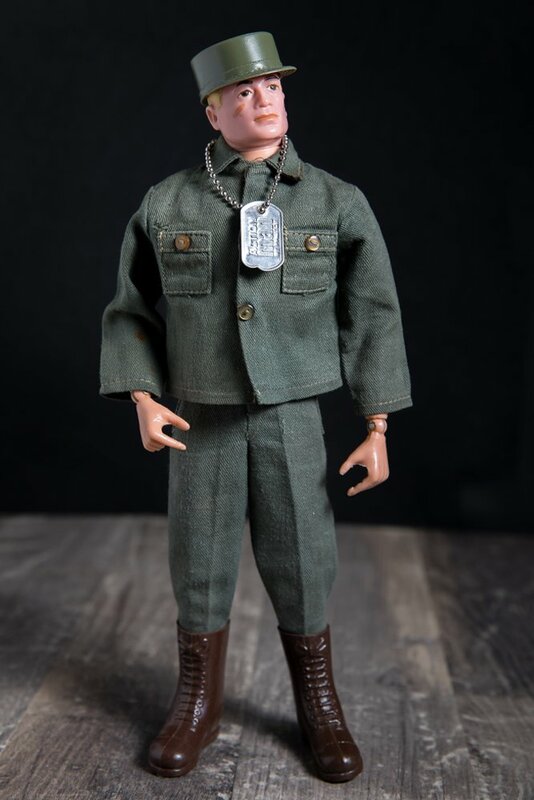 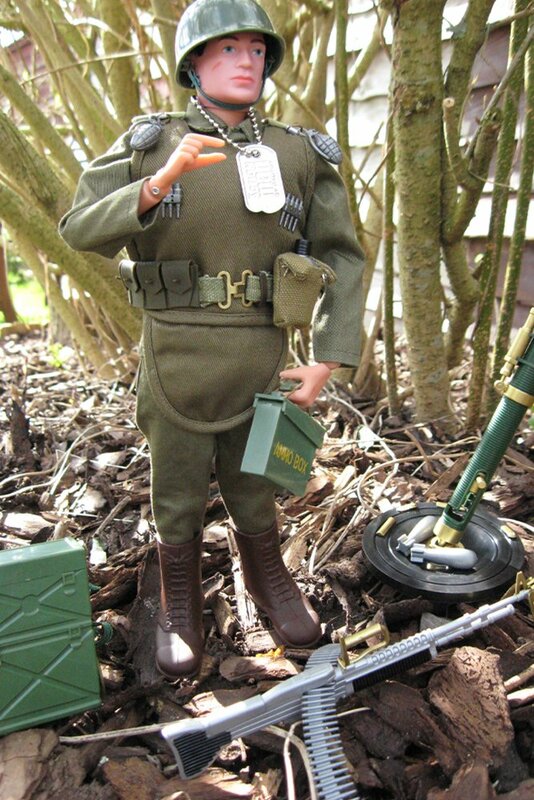 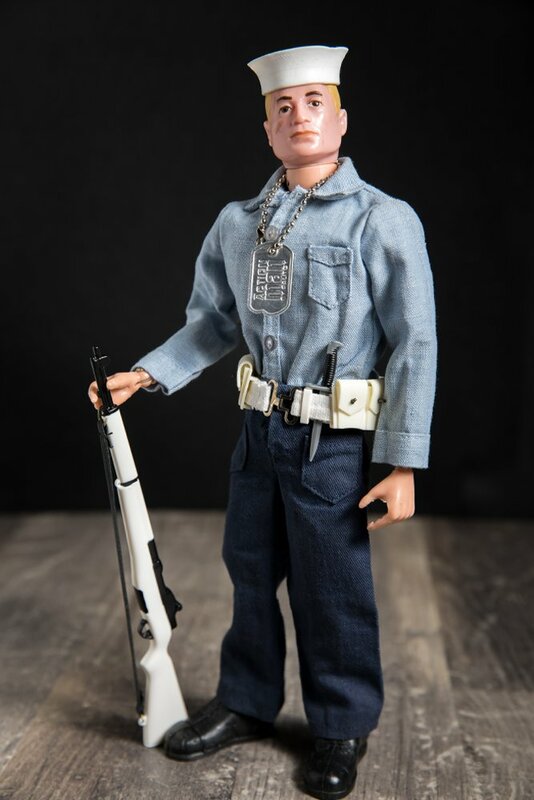 1966, Combat Paratrooper, Built over several accessory cards Includes: Camouflage Fatigues, Parachute Pack, Carbine, Helmet, Helmet Netting, Knife, Grenades, Canteen, First Aid Pouch, Pistol Belt. 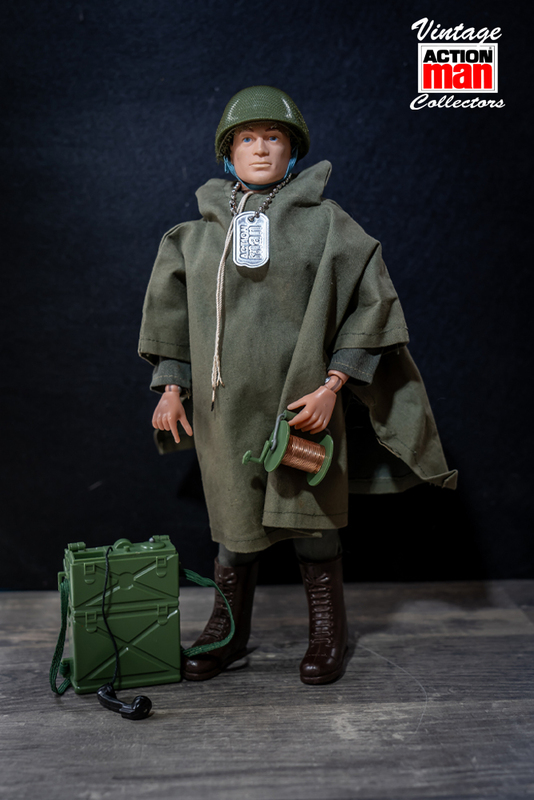 1966, Command Post, Made up from various side cards which look impressive when together, basic soldier fatigues, Weather cape, field radio, coiled wire, map case & Map, Helmet, Helmet netting, belt and Cold 45 with pistol belt. 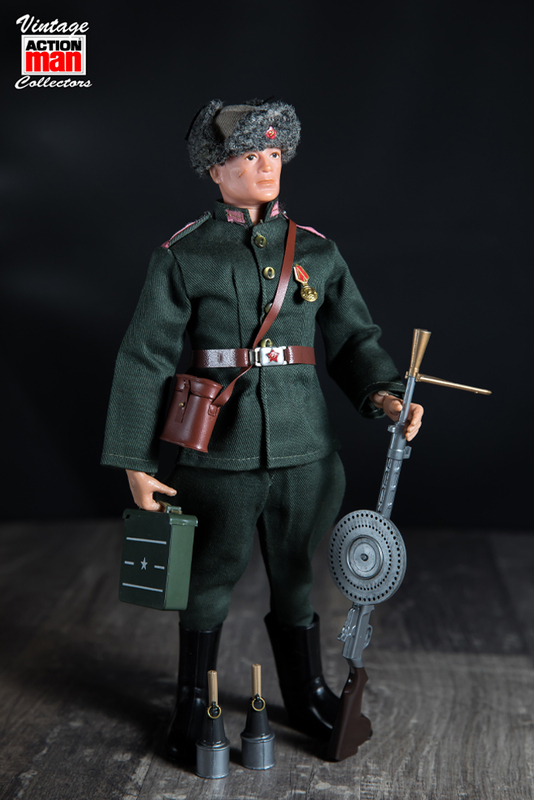 1967, German Stormtrooper (Soldiers of the Century) This famous range of 6 uniforms from this era are classics and highly sought after by collectors, German Stormtrooper includes: Tunic, Trousers, Jack Boots, Iron Cross Medal, MP40, Belt, Kar98 Cartridge Pouches x2, Potato Masher Grenades x2, Backpack, and Helmet. 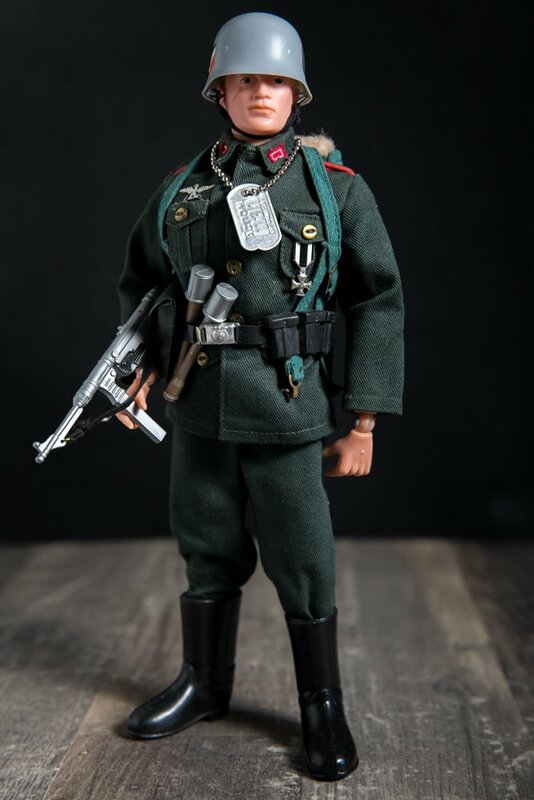 1967, French Residence Fighter (Soldiers of the Century) This famous range of 6 uniforms from this era are classics and highly sought after by collectors, French Residence includes: Seater, Jeans, Black Boots, Croix de Guerre Medal, Grease Gun, Shoulder Holster and Revolver, Knife, Grenades, Beret, and Camo Radio. 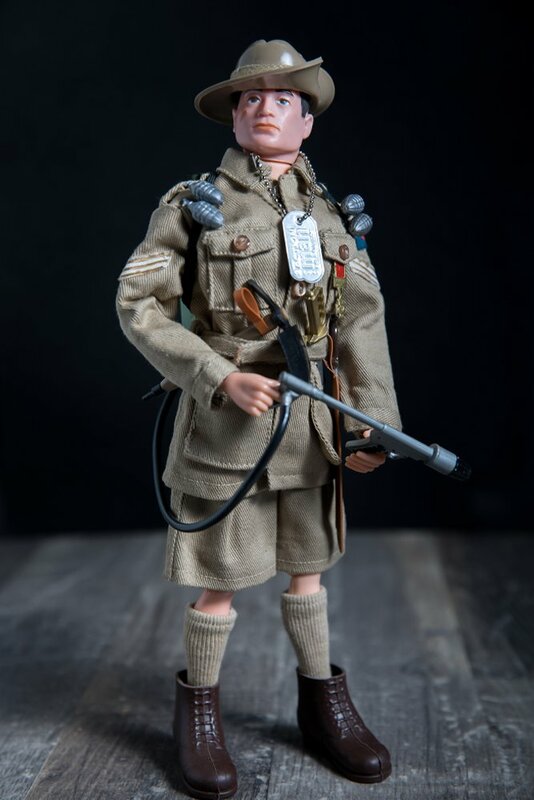 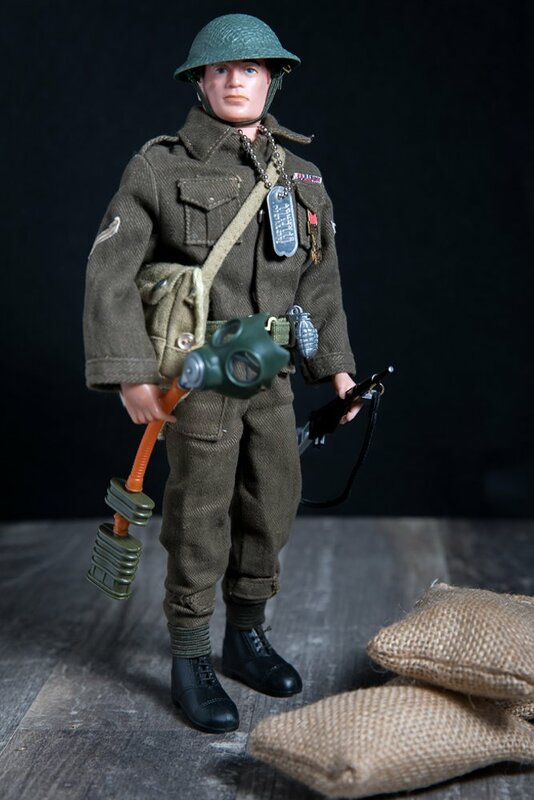 1967, British Infantryman (Soldiers of the Century) This famous range of 6 uniforms from this era are classics and highly sought by collectors, Brit Infantry includes: Tunic, Trousers, Lace Up Boots, Victoria Cross Medal, Sten Gun, Belt, Canteen, Gaiters and Helmet. 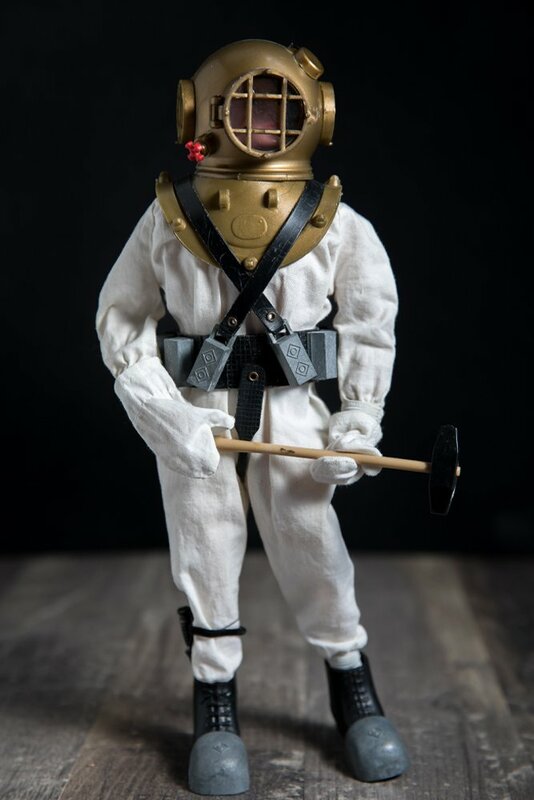 1967 Deep Sea Diver, One of the most iconic Action Man outfits, Outfit Includes: Diving Suit, Boots with Lead Weights, Belt with Lead Weights, Oxygen Hose with working Compass, Sledge Hammer, Buoy, Knife, Rope, Gloves and Helmet. 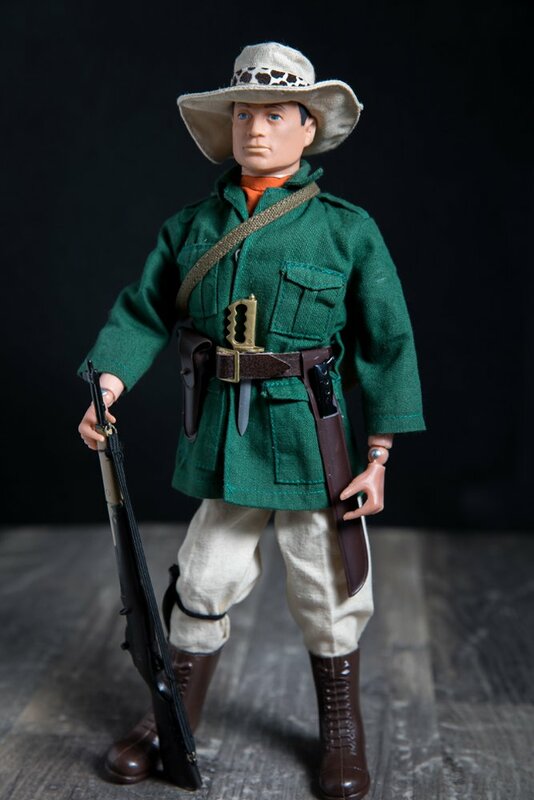 1969, Jungle Explorer, Another popular outfit that ran the entire range, Outfit Includes: Tropical Jacket, Trousers, Tall Brown Boots, Bush Hat (A Pith helmet was also available on a small card) Orange Scarf, Pistol Belt wit Revolver, Knuckle Knife, Machete and Bag with Hypodermic Darts. 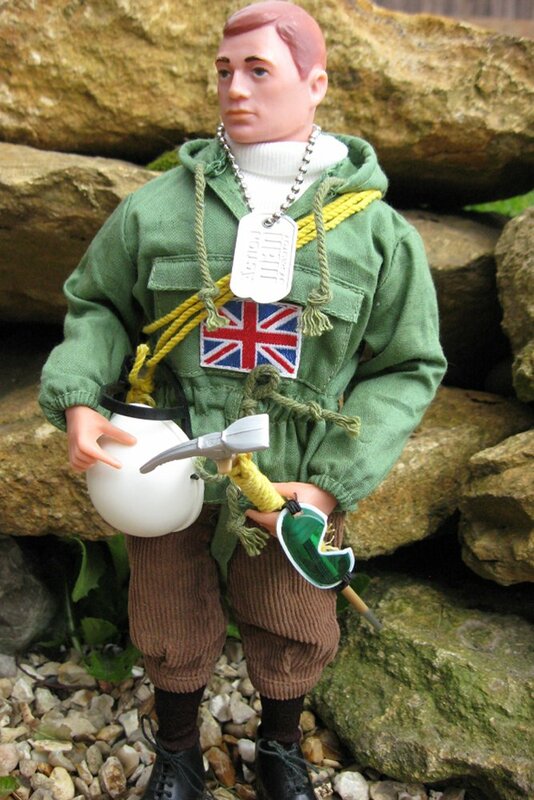 1969, Mountaineer, Another famous non military outfit that ran with subtle changes throughout the entire run. 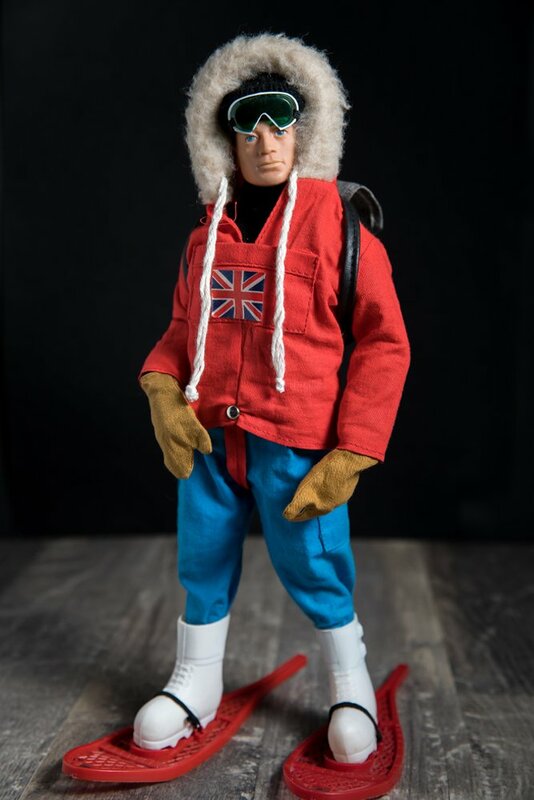 Outfit Includes: Anorak (Orange although a rare green one was available on a small side card) Knee breeches, Brown lace Up Boots, Ruck Sack, Ice Hammer, Crampons, Ice Pick, Socks, Pitons, Karabiners, Rope and Suction Cups, The white helmet was available on a side card.